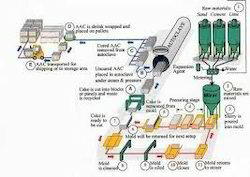 Prominent & Leading Service Provider from Surat, we offer turnkey solution for aac plant. Autoclaved Aerated Concrete Bricks is an ultra-light concrete. We provide Autoclaved Aerated Concrete Bricks Services. It is formed by thousands of homogeneous and totally independent air cells that provide AAC its superior properties such as thermal insulation and fire resistance, which can only be achieved in traditional systems through the combination of different materials. AAC is produced from five raw materials: silica sand, lime, cement, gypsum and water, combined with an expansive agent. The special combination of these materials provides a material with excellent construction properties such as structural strength, lightness, thermal insulation and fire resistance.